“Amidst a spate of law enforcement raids and other regulatory actions taken by local, state, and federal officials against raw milk producers across the country, an alarmed group of small California dairy farmers and consumers have recently formed the Food Rights Coalition and begun to push state regulators and legislators to take action to help them. The coalition formed in response to at least a half dozen cease and desist orders issued by the California Department of Food and Agriculture (CDFA) over the past year to small dairy herdshares across the state. Thanks to the many readers, contributors and promoters who have helped The Bovine reach this exalted number on the WordPress hits counter. The counter rolled over past one million some time yesterday, which by no coincidence I’m sure was also the date of the winter solstice. Such synchronicity. Here on the Bovine we used to have to dredge for news in the Google Alerts, but lately we’ve been getting more and better news tips from our readers. Thanks to all of you who have read the blog, posted comments, or sent us links. And thanks to Michael Schmidt and other raw milk farmers who are putting their livelihoods on the line to build a more humane future for our children and their descendants. In the excerpt below from his The Complete Patient blog, David Gumpert describes strange things going down south of the border, with RAWMI reps putting forward legislative proposals in Wisconsin and Minnesota, without first engaging in any consultative working together with local raw milk groups. 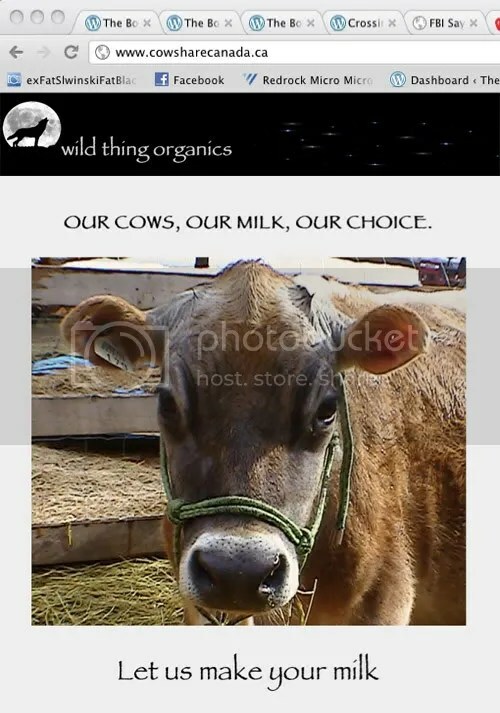 "Our Choice" alright -- Composite image from Wild Things Organic homepage. But Canada, it seems, is also not immune to conflict among raw milk supporters. We’ve got our own tempests in teapots, most recently around the domain name for Cowshare Canada being registered by Wild Things Organic in B.C. 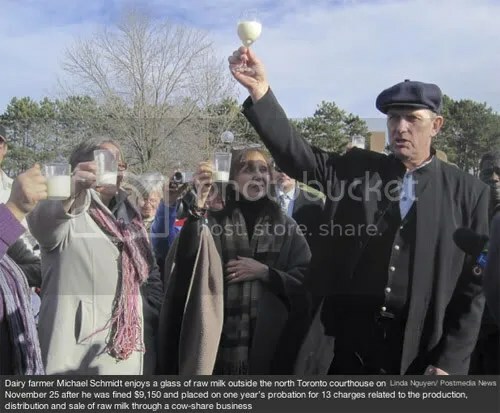 “TORONTO — A former Ontario raw-milk farmer convicted last month for operating an illegal cow-share program has not given up his nearly 20-year long legal battle with the government.